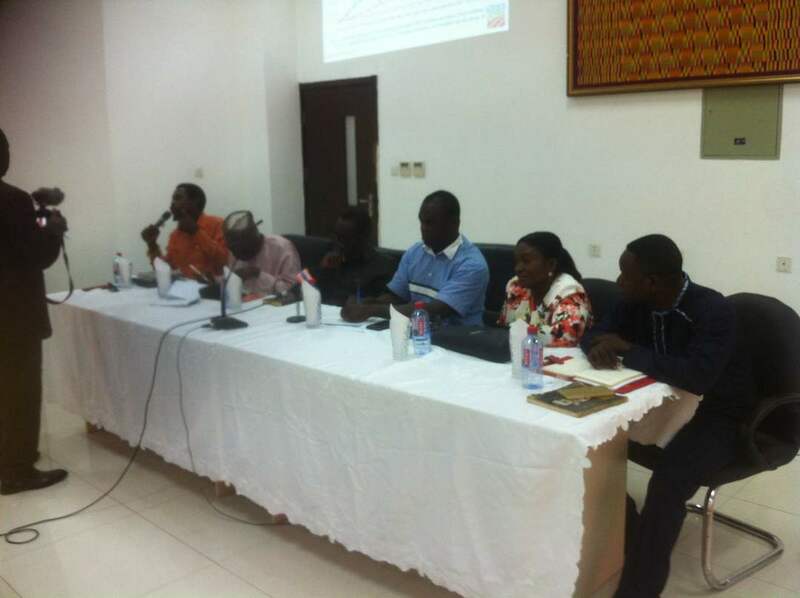 Ghana’s GM-Lobby Loses Debate On #GMOs! PHOTO: From Left to right, Edwin Baffour, Communications Director, Food Sovereignty Ghana; Prof. Alhassan-Lansah Abdulai, Agro-Meteorologist, CSIR-SARI; Eric Okoree, Chief Executive Officer, National Bio safety Authority. Dr. Solomon Gyan-Ansah, Deputy Director for Crop Services, Ministry of Food and Agriculture; Dr. Vivian Oduro, Senior Research Scientist, Biotechnology and Nuclear Agriculture Research I Institute, Ghana Atomic Energy Commission; Mr. Edward Karaweh, General Secretary, Ghana Agriculture Workers Union. Following a successful debate on the topic, “Are Genetically Modified Foods Safe To Eat?” held at the Obed Asamoah Conference Room of Ministry of Foreign Affairs on Wednesday, 13th December, 2017, Food Sovereignty Ghana was again invited today, Tuesday, 16th January, to a “Question and Answer Session On Genetically Modified Foods And Its Implications For Ghana”. Mr. Edwin Kweku Andoh Baffour, the Director of Communications of Food Sovereignty Ghana, and Mr. Edward Karaweh, General Secretary, Ghana Agriculture Workers Union. represented the opposition to the motion. In favour, were Prof. Alhassan-Lansah Abdulai, Agro-Meteorologist, CSIR-SARI; Eric Okoree, Chief Executive Officer, National Bio safety Authority, Dr. Solomon Gyan-Ansah, Deputy Director for Crop Services, Ministry of Food and Agriculture; and Dr. Vivian Oduro, Senior Research Scientist, Biotechnology and Nuclear Agriculture Research I Institute, Ghana Atomic Energy Commission. The debate, which was part of the Ministry’s capacity building strategies to enrich the knowledge of officers at the Ministry ended with a show of hands by the audience. When the question was put at the end, only two people in a room of forty seven (47) raised their hands in favour of GMO after four people on the panel spoke in favour of GMO .The first debate was held on December 13, 2018 on the theme “Are GMO foods Safe to eat” and for the record not one person raised their hands in favour of GMO in a room of more than 60 people.